... well, it's a bit more than a 'jog'! Yep, I'm still alive and writing! I'm delighted to inform you that a (nearly) grand total of 29,246 CZK (1540 USD, 981 GBP, 1095 EUR) has been donated as a birthday gift to IBTS in celebration of its 60 years! These gifts have come from people around the world (note sidebar) who see the importance of such a unique seminary! You will notice that previously I had hoped to reach the 1500 USD mark, and though I'm sure many were skeptical it has been done. Yippee! Thank you for your hard work and commitment to IBTS and your support during these months of training for the Jubilee Jog! ps - There is still a promised 50 more British pounds and 100 more US dollars on the way. Plus still a few folk who need gentle prodding (!) to open their wallets and produce a bit of promised change. Not the Last of Me! It has been a month and one day, since crossing the finish line in the most beautiful city of the world. And I've got the running itch again! No, I don't need cream, I just need to get out and run! Ashamedly, only once have I booted up and found myself whizzing through the Sarka valley trails. 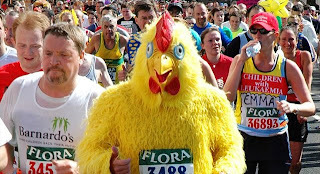 However, Sunday seeing bits of the London marathon on Eurosport made me think if these popular actors/actresses, singers and human-sized chickens can run 42 kilometres surely I can! So, it's in my mind... but first, there's a women's 5K in September here in Prague - much more reasonable as it's something I know I can do AND I still get all kinds of free stuff! You haven't seen the backside of me for good yet! The race is over and the donations are coming! When Lenka, our IBTS accountant, enters my office a smile spreads across my face. In her hands she is often carrying a receipt from a Jubilee Jog supporter from the money they have donated to IBTS. Recently sums of Czech crowns have been given by some sceptic observers, who were clearly steeled against donating until all six feet from the IBTS runners crossed the finish line! Thankfully they did! I'm delighted to report that thus far the total amount which has come in is 17,810 CZK (859 USD, 601 GBP, 647 EUR) ! I have every confidence that we will reach 1000 USD, but I'd love to report to my Rector that 1500 USD came in to help our seminary! Even if your name's not on the right margin of sponsors... it can be! Every little bit helps! Anna and I - running partners for most of the race. It was great to have company! Tim, who ran on ahead of us. He was key in helping me train during the past months. And still smiling at the end! Completing this half-marathon was one of the most amazing feelings of accomplishment I've ever experienced, particularly remembering back to September and the many occasions since then when I doubted my ability to run 21.0975 kilometres - and in fact had no ability to do so! An even stronger emotion comes from the fact that I ran for IBTS, a place that I love. There's an undefinable feeling which tickles my tear ducts when thinking that the training and tiredness brought in some help for students to study theology at an amazing seminary. Not to worry, the grand total will soon be posted! You still have the opportunity to add your bit!! Certainly, there were times during the run which I wouldn't have minded being a spectator, but never once did I think to quit nor regret the six-month-old commitment to run. And happily, I was able to run the complete race and even finish with some leftover energy. Authentic photos with this marathoner with her medal are still trapped on friends' cameras, but will appear here as soon as possible. And don't worry, I've much more to say - so more posts are to come! Particularly about the thoughts along the run and the fans who showed up (some a few times!) to cheer us on. I've been informed that over 7,000 people are running in the Prague Half-Marathon! By the time I cross the start line, some will be running through the finish-line ribbon! 7,000 - I can't imagine, truly can't! I said I wasn't bothered about the weather. I lied - below is the day's weather forecast. Many sponsored myself and two others whilst we ran the Prague Half Marathon on 28 March. This was in celebration of the Diamond Jubilee for IBTS, which has been training men and women for service for the Kingdom for 60 years! Would you consider joining IBTS in celebrating the Diamond Jubilee? If you missed the opportunity to sponsor our run, its okay! To read more about the amazing work of the seminary over the years and how you can take part in supporting this important school, you can visit the website or ASK! I love challenges and this seminary ~ so off I went jogging through Prague with a few friends! 1) Click on the "Online Donation form"
4) Click "Send" and smile widely!